Today we are going to discuss linear inequalities , solving inequalities , linear inequations of one variable , linear inequalities in two variables , graphing inequalities , solving linear inequalities , system of linear inequalities , linear inequalities examples , application of linear inequations and its formation with the help of some examples. An equation which contains variables of 1st degree and does not contains product of variables is called Linear Inequation . These are called Linear Inquations Of One Variable. These are called Linear Equations Of two Variables . Shifting the constant term to R.H.S. Isolating x from L.H.S by dividing with -2 on both sides and change the sign of Inequality. Note : Whenever we divide or Multiply any Inequality with minus number ,then the sign of that inequality changes , i.e. < to > and < to > or ≤ to ≥ and ≤ to ≥ . Add or Subtract the -ve of constant number appearing with x (Here -ve of 4 ) to eliminate the constant term in middle of the inequality . ⇒ All those values which are between -563 and 143 are solution of given Inequality . In order to solve such a constraints , 1st of all draw graph of linear Equations x = 0 (which is known as y axis) , y = 0 ( which is known as x-axis ) , 4x + 7y = 28 simultaneously . As we know that graph of the line x = 0 is the line y - axis and graph of the line y = 0 is the line x - axis . Now to draw the graph of line 4x + 7y = 28 , Put x = 0 and y = 0 in given line respectively and find the values of y and x . So if x = 0 in the equation , we get y = 4 , and when we put y = 0 in line 4x + 7y = 28 , we get x = 7 .
we get two points A(0,4) and B(7,0) . Now check the feasible region of each lines , as x ≥ 0 implies right half of the Cartesian plan ( including y - axis ) and y ≥ 0 implies upper half of the Cartesian plan ( including x - axis ) . So from these two inequalities we get the 1st quadrant as the common/feasible region . Now plots both the points A(0,4) and B(7,0) in the plan and draw a line passing through these two points. Now put (0,0) point in the inequality 4x + 7y ≤ 28 , If it comes out true then feasible region will be toward origin and if it comes out false then feasible region will be away from origin . 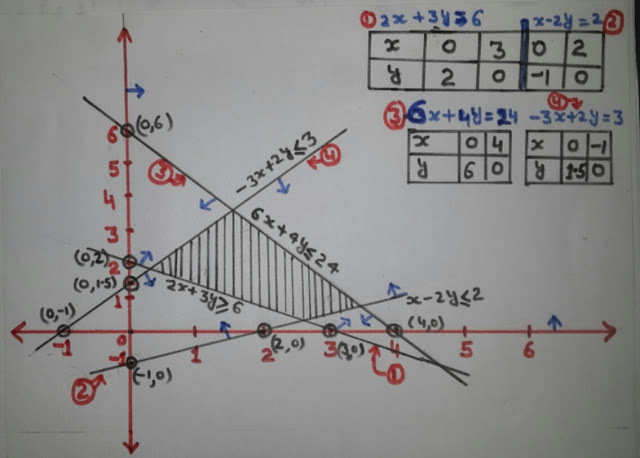 Now mark the common region from all the inequalities and shade it , The shaded region will be the required/feasible region after graphing linear inequalities or system of inequalities . i.e The solution of the given constraint. As we know from previous problem x ≥ 0 ; y ≥ 0 the common region from these two inequalities is in 1st quadrant. 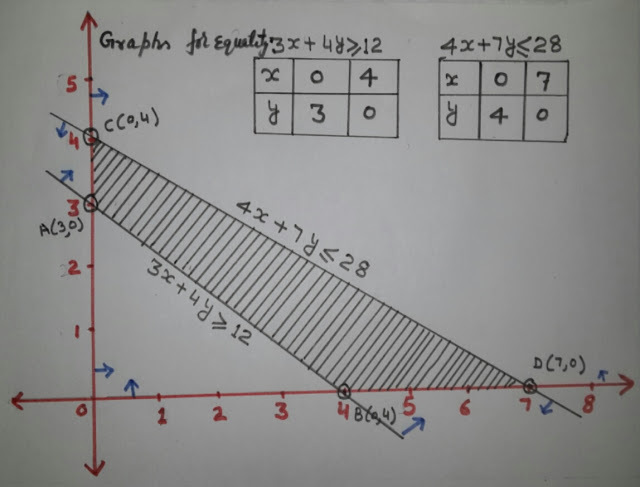 Now Draw the graphs for two lines 3x + 4y = 12 and 4x + 7y = 28 . Put x = 0 and y = 0 in 1st equation , we get y = 3 and x = 4 respectively . Therefore two points will be A(0,3) and B(4,0) . Similarly put x = 0 and y = 0 in 2nd equation respectively , we get y = 4 and x = 7 respectively .Therefore two points will be C(0,4) and D(7,0) . Now plots both the points A(0,3) and B(4,0) in the plan and draw a line passing through these two points. Also plots both the points C(0,4) and D(7,0) in the plan and draw a line passing through these two points. Now put (0,0) point in the inequality 3x + 4y ≥ 12 and 4x + 7y ≤ 28 , If it comes out true then feasible region of that inequality will be toward origin and if it comes out false then feasible region of that inequality will be away from origin . 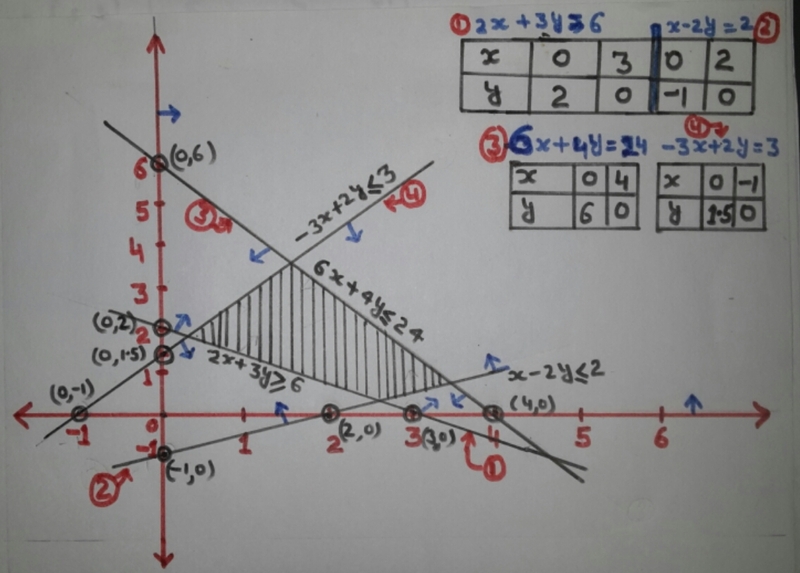 At last mark common region from all the inequalities x ≥ 0 ; y ≥ 0 ; 3x + 4y ≥ 12 and 4x + 7y ≤ 28 and shade it , after graphing linear inequalities. The shaded region will be the required/feasible region ( As shaded in the above figure ) i.e. This is the solution of the given constraint. As from previous problems x ≥ 0 ; y ≥ 0 the common region from these two inequalities is in 1st quadrant. 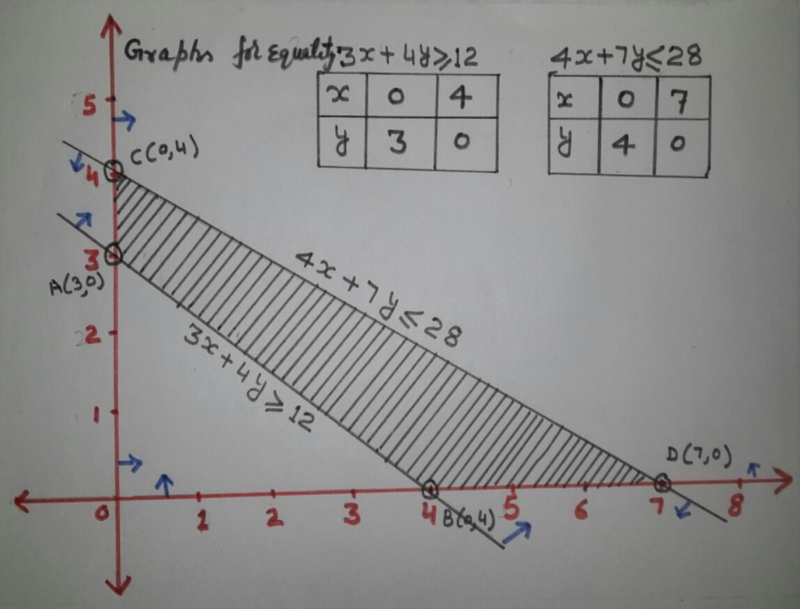 Now Draw the graphs for two linear lines 2x + 3y = 6 ; 6x + 4y = 24 and -3x +2y = 3 . Put x = 0 and y = 0 in 1st equation 2x + 3y = 6 , we get y = 2 and x = 3 respectively . Therefore two points will be A(0,2) and B(3,0) . Now put x = 0 and y = 0 in 2nd equation x - 2y = 2, we get y = -1 and x = 2 respectively .Therefore two points will be C(0,-1) and D(2,0) . Put x = 0 and y = 0 in 3rd equation 6x + 4y = 24 , we get y = 6 and x = 4 respectively . Therefore two points will be E(0,6) and F(4,0) . Also Put x = 0 and y = 0 in 1st equation -3x + 2y = 3, we get y = 3/2 and x = -1 respectively . Therefore two points will be G(0,3/2) and H(-1,0) . Now plots both the points A(0,2) and B(3,0) in the plan and draw a line passing through these two points. Also plots both the points C(0,-1) and D(2,0) in the plan and draw a line passing through these two points. in the plan and draw a line passing through these two points. therefore there will be four lines in 1st quadrant. Now put (0,0) point in the inequality 2x + 3y ≥ 6 ; x - 2y ≤ 2 ; 6x + 4y ≤ 24 ; -3x + 2y ≤ 3 , If it comes out true then feasible region of that inequality will be toward origin and if it comes out false then feasible region of that inequality will be away from origin . At last mark common region from all the inequalities x ≥ 0 ; y ≥ 0 ; 3x + 4y ≥ 12 and 4x + 7y ≤ 28 and shade it , The shaded region will be the required/feasible region. ( As shown in the figure above ) i.e. This is the solution of the given constraint. Problem : In the first four papers each of 100 marks , Ravi got 99 , 88 , 77 , 96 marks . If he wants an average of ≥ 80 marks and ≤ 85 marks , Find Find the range of Marks he should score in the fifth paper . five papers and divided by 5. It means in order to get average of greater than equal to 75 and less than equal to 85 marks , he should score in the range of 40 to 65 marks in the Fifth Paper. Problem : The longest side of a triangle is twice the shortest side and the third side is 2 cm longer than the shortest side . If the perimeter of the triangle is more than 166 cm then find the minimum length of the shortest side. given that third side is 2 cm longer than shortest side. This implies the shortest side of the triangle must be 41 cm in order to satisfies all the conditions . Perimeter : Perimeter of a triangle is the sum of all the sides of given triangle . 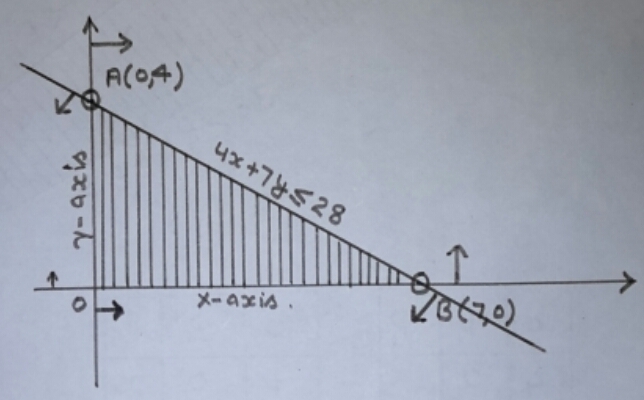 In this post I have discussed Linear Inequations , linear inequations of one variable , solving linear inequalities, graphing linear inequalities,system of inequalities, linear inequalities in two variables, system of linear inequalities, linear inequalities examples, and Application of linear inequations . If this post helped you little bit, then please share it with your friends to benefit them, comment your views on it and also like this post to boost me and to do better, and also follow me on my Blog .We shell meet in next post till then Bye .